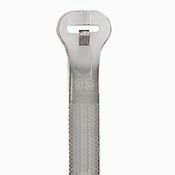 7-1/4"L x 1/4"W unbreakable, self-locking nylon ties feature ribbed and stippled gripping surface. Accomodates bag neck diameter of 1/16" to 1-3/4" and seals it securely. 250 ties/pack. Priced per pack.